Eggless Thandai Cake is a yummy cake especially for Holi Season made using Thandai powder and glazed with strawberry crush and almonds. People love to consume Thandai during Holi and Mahashivratri and this cake gives them a extra way to indulge in this deliciously tasty cuisine. You can bake this cake at home without any special ingredients and it doesn't require butter or condensed milk. What's more - it is quick to make. A nice layering effect is given in this cake to make it more appealing! Do try it today. Grease cake mould with oil and dust it well with all purpose flour. Keep aside. 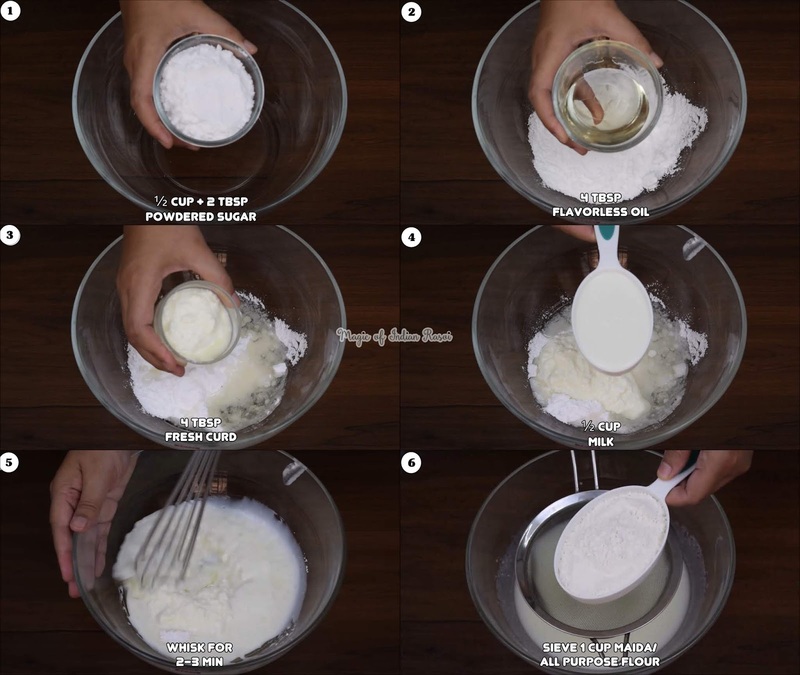 In a bowl, whisk sugar, oil & curd for 1-2 min. Place a sieve over the wet ingredients bowl and add maida, cornflour, baking powder & baking soda. Sieve it. Add thandai powder, cardamom powder & rose essence. Mix everything using a spatula or whisker. Just mix until there no lumps visible. Do not over mix this batter. 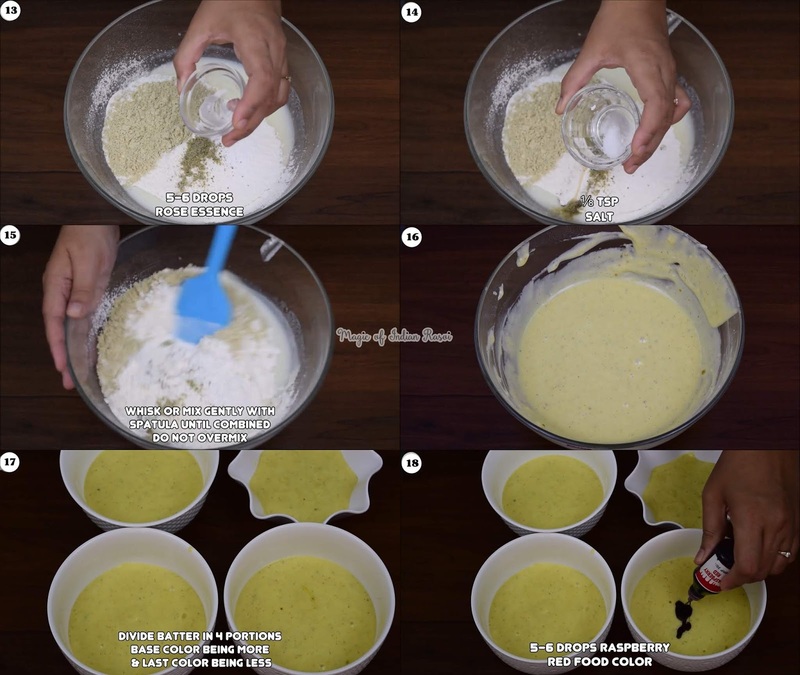 Divide this batter into 4 portions. 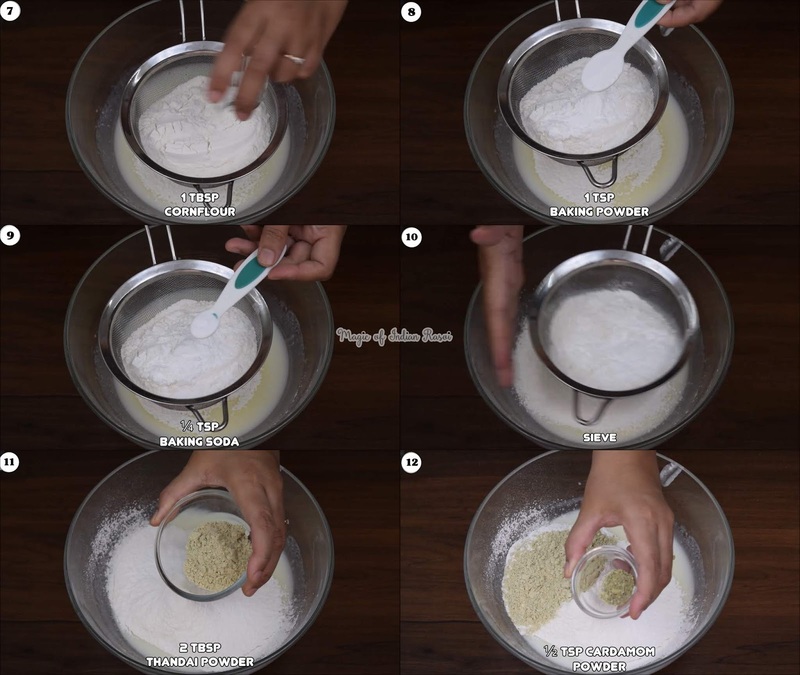 Reducing batter in each bowl as you divide. 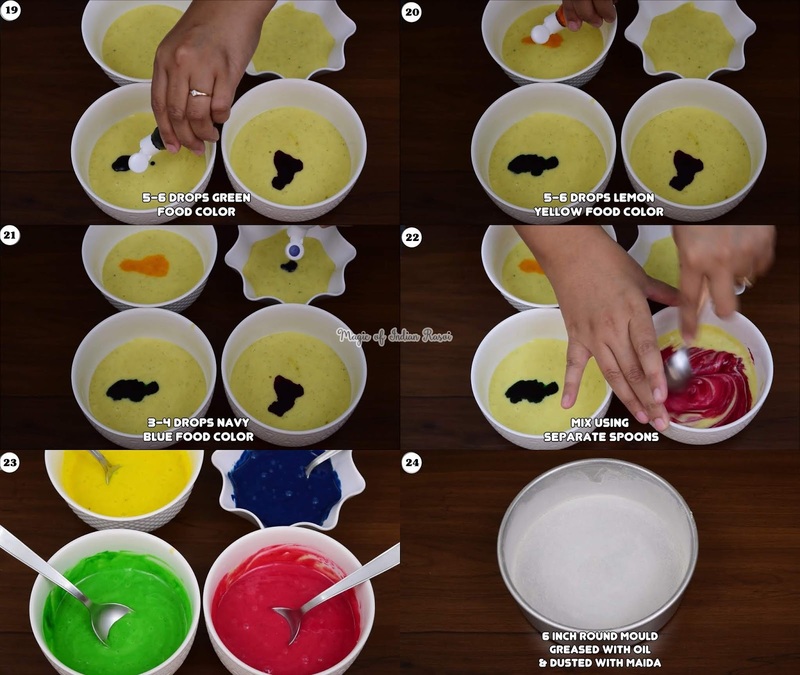 Color the batter with food colors - in order of red, green, yellow & blue. Pour red batter in the centre of the mould & let it spread on its own. Pour green batter in centre over red. 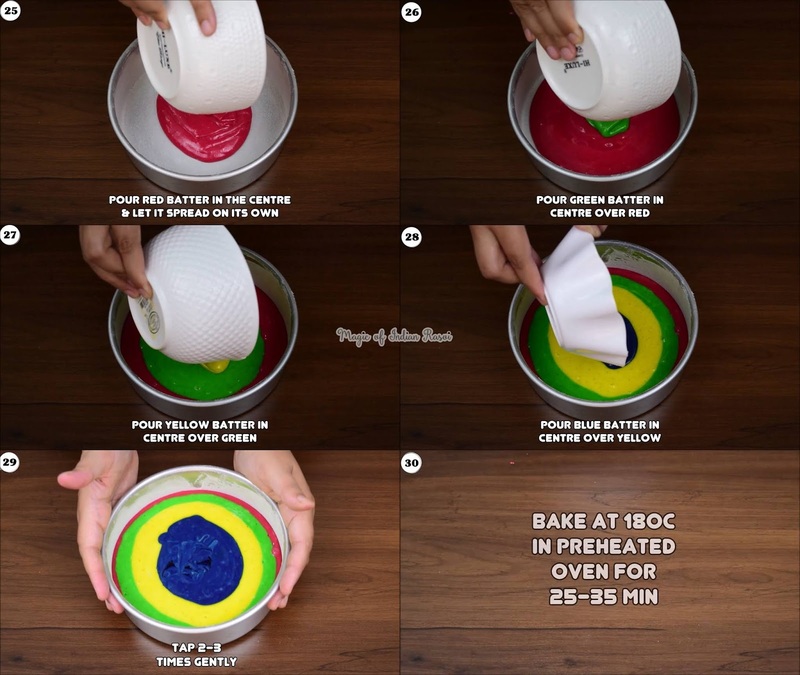 Pour yellow batter in centre over green. Pour blue batter in centre over yellow. Bake at 180 C in preheated oven for 25-35 min until toothpick inserted comes out clean. MyCake was done in 30 min. Cool down completely & then refrigerate for 30 min. De-mould cake in a serving plate & drizzle strawberry crush over it. 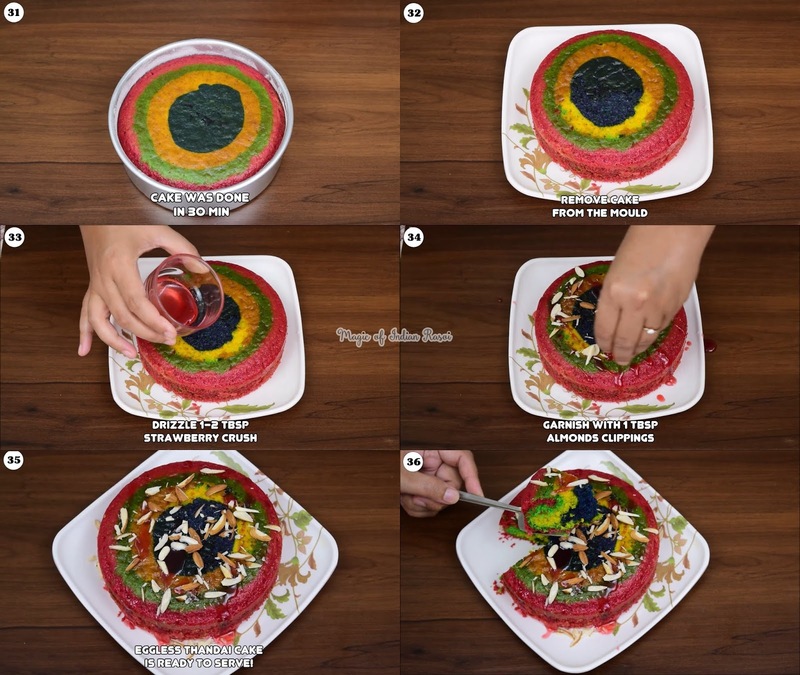 Cut into desired pieces & Eggless Colorful Thandai Cake is ready to serve!